If you (or an agency working on your behalf) try to boost your PageRank by fiddling with back links then sooner or later you will get blacklisted. Google hates companies that try to manipulate their search engine rankings by buying links or entering into link building schemes that are intended to boost PageRank. 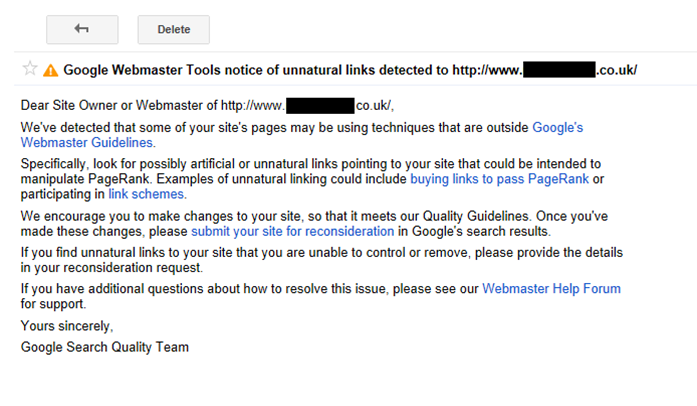 Take a look at the last section of Google Webmaster Guidelines (Quality Guidelines – Specific Guidelines). Also take a look at this page on (link schemes). Unfortunately some poor companies in the past have employed what they thought were reputable SEOs and ended up blacklisted due to dodgy links. Here is a screenshot showing a typical message that you would see in your Webmaster Control Panel. Go to your Google Webmaster Control Panel and download a list of the links that are pointing at you. Sort those links into good and bad links. Contact all of the webmasters of the websites that you don’t want to receive links from and ask them to remove you from their website (Good Luck With That One). When you have done all you can you should use the Google Disavow Links tool. Finally you should submit a re-submission request. How long does re-submission take? Matt says you should have a response in 2 weeks and he says to send a reminder if you don’t hear from Google within that time frame. In my experience you are lucky if you get a response in 3 months. However, most of my experiences started when Panda was launched and I guess they were overrun with re-submission requests. Google Data Centres WordPress SEO: How should I optimise the blog page?